The Automatic Tie Points information is displayed when an Automatic Tie Point is selected in the 3D View. Automatic Tie Point name (Automatic Tie Point): A unique name that identifies the Automatic Tie Point: ATP [number], where number is unique. 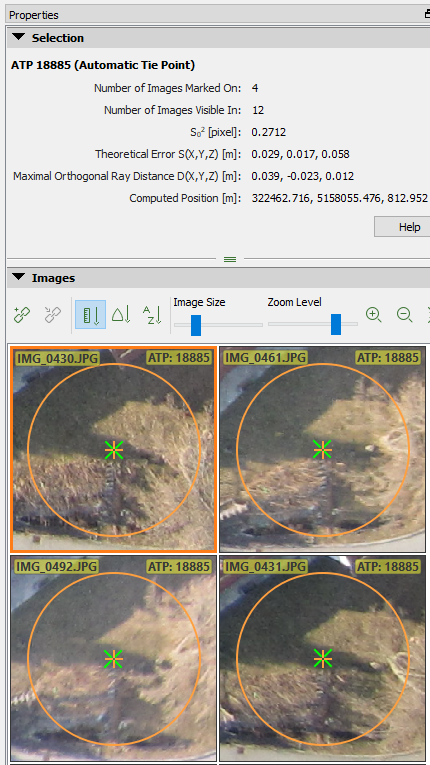 Number of Images Marked On: Number of calibrated images on which the point has been automatically marked (identified as the same 2D keypoint). Number of Images Visible In: Number of calibrated images on which the 3D automatic tie point has been reprojected (number of calibrated images where the computed 3D point is visible). Sο2[pixel]: A posteriori variance component of all the marked points for a given 3D point. For more information: 3D error estimation from tie points. Theoretical Error S(X,Y,Z)[units]: Theoretical error estimation. For more information: What is the Theoretical Error S(X,Y,Z) of a computed 3D point?. Maximal Orthogonal Ray Distance D(X,Y,Z)[units]: Maximal distance from the estimated 3D point and all the rays used to compute that 3D point. The distance is measured between the 3D point and the point defined by the line perpendicular to the ray passing through the 3D point. For more information: What is the maximal orthogonal ray distance?. Computed Position [units]: X, Y, Z position of the selected point. The Images section: Displays the images where the point is marked on and visible in. For more information: Menu View > rayCloud > Right sidebar > Images section.